If you need to inject doughnuts, fill tarts, spread fondant on buns or chocolate on eclairs, then the Edhard is the machine for you. 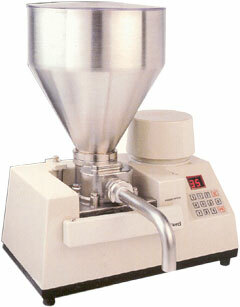 A wide selection of power units, hoppers and attachments to provide a complete injecting/filling system. Attachments include éclair spouts, cupcake spouts, layering and croissant spouts. Heaters for stainless steel filler units. Custom spouts built to your specifications. Powered Turntables available with 12" diam. removable table, variable speed, 60lb. capacity, forward and reverse rotation.